That would be a nice construct to have because you can do 2 assays with it: transcriptional repression from cI-dependent promoters, and periplasmic targetting with alkaline phosphatase. Your design of this part depends on your reading of the paper and the availability of materials from which you could construct the things they describe. You'll probably want to discuss the design of your part with JCA after you have read and made sense of the paper. 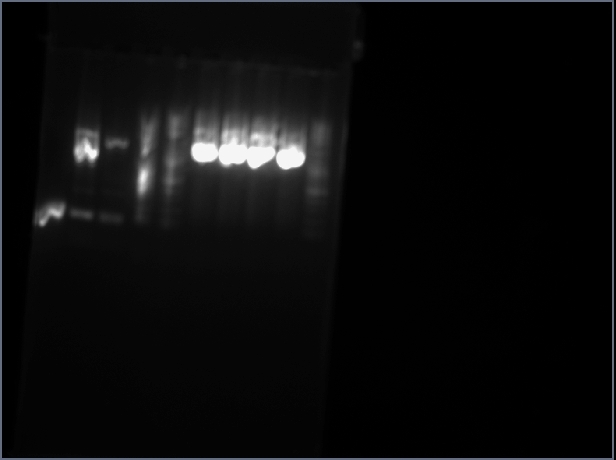 Your final construct should be a normal BglBricks part in plasmid pBca9525. 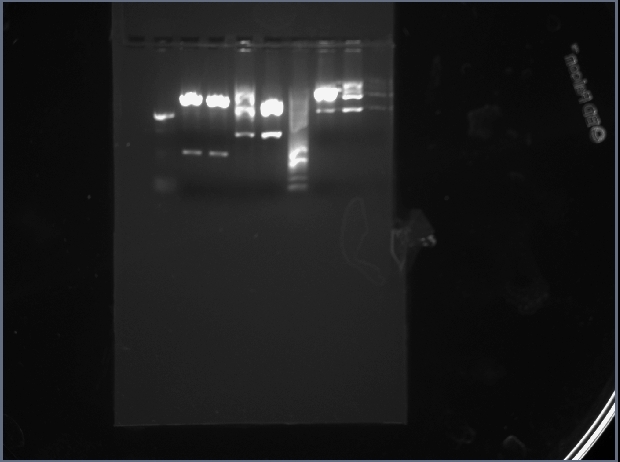 You most likely will want to piece the part together from two (or more) pcr products. The cI construct can be amplified from pBca9145-jtk2768. You can get PhoA from plasmid pBjh1601CK-Bjh2128. Here is an example of what your trying to make pBca9525-sbb1230. You are going to put the homodimer on the C-terminus of a truncated ToxR. For this part, you're going to go off BioBricks. Kindov. Your final product will be a BioBrick, but you are going to use an ad hoc procedure to create it. You should examine this illustration which refers to two sequences: pBca9525-Bca1834 and pBca9525-Bca1839. The important thing here is that you think through the translation frame of the final product, and make sure that you add some linker between your sequence and the sequence 5' to it. You should also remove the start methionine from you homodimer, unless your project description explicitly says not to. You should include the stop codon. The product of your construction file should resemble pBca9525-Bca1839 in terms of it encoding a full expression cassette containing a ToxR fusion protein with your designed feature. If you were given part sbb1293, your product would be called pBca9525-sbb1293. Created 100uM dilutions of o16 o17 o12. nmol weight x10 = uL of ddH2O need to add to get to 100 mM. Label tube 1214. Place on PCA rack. Template material and fragments for SOE placed in Eluded Products box. Could not conduct SOEPCR gel or setup. Doing next tuesday. Cut out band which correspond to correct size. No 500 band appeared in lane 10 so its doubtful. Too much liquid for 1 column. Performing 2 rounds. Added 50 uL H2O. This amount was not correct should have only eluded w/8uL. Possible that product is too diluted for later steps to work. Cut out band at 2K place in tube labeled 1231SOE3 600uL ADB. 2 bands show up. one considerably brighter and heavier, Selected smaller band because it looks closer to the target 1800 bp I expect. Label 1214 Lig. 1028-1058 bench top incubate. Thaw cells and label cell prep. add 50 uL H2O. Cells plated on Spec plates using alcohol sterilized wand. One sample vial of cultured cells found 1214-1. Apparently only 1 colony was picked. Because final expected product did not show up in gel last time, I need to start over. Reconstructing CITM and TM PhoA. Not enough time to transform and plate cells. Looking back on my notes, I did not run the second round of PCA w/ o16 and o12 on pca1. My results from the analytical gel would seem to indicate that I had performed the correct reactions even though I did not record them in my notebook. I continue with the restart anyways. There is not enough time to ligate and plate. 1214Pca1 amp purified using zymo small fragment procedure. Begin digestion with NheI and BamHI. Result is 1214 dig. 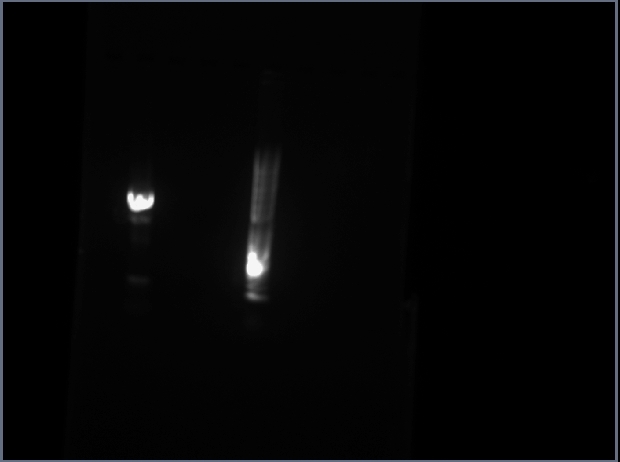 Transform cells with RO 1231 Lig in thermomcycler at 42 C for 90 seconds. Incubate on bench for 30 in. 1031-1101. 4 Colonies were picked by Zach. 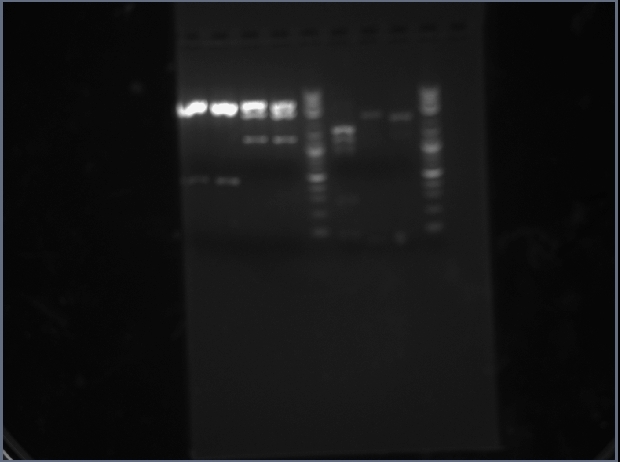 Turns out none of the cell cultures were viable and the plates I created were totally unusable. There are 2 large red clusters where cells survived. The colonies that were picked were likely contamination from when I leaked. It is also possible that the transformation totally failed. 4 colonies picked. All 4 cultures are viable. 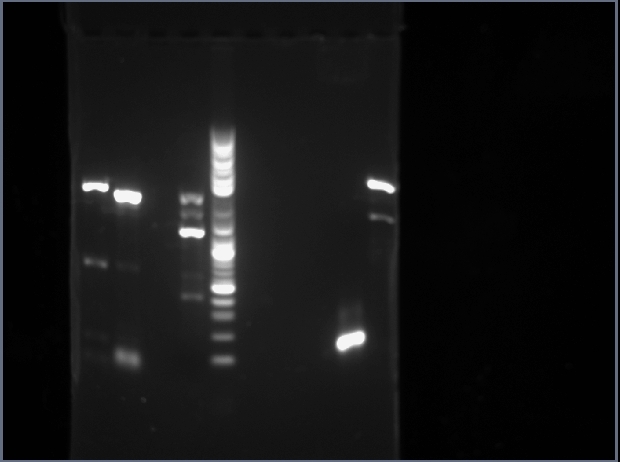 Not enough time to incubate and run the gel. Performing the gel on Thursday. Removing 1231ROCT, 1231PCR3, 1231CITM, 1214Pca1, 1231TMPhoA from storage in order to make space. Not enough time to complete the experiment. I can redo the transformation and plating to at least figure out if my products were viable. If white colonies appear the Friday on a plate, I can say that the transformation at least happened. 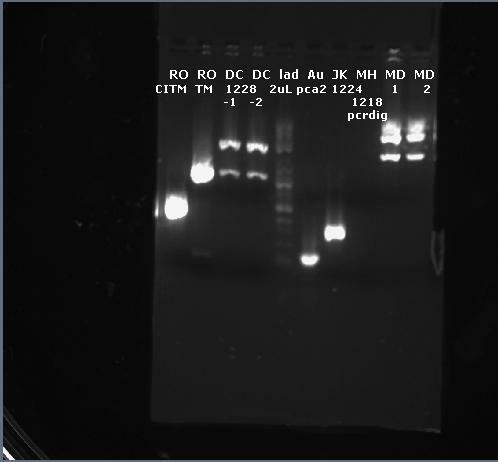 Rerun ligation 1031-1101. pBca9525-Bca1834 digested with BamHI and EcoRI and ligated with RO 1231 Dig. Product is RO 1231 Lig2. Cutting incubation 7 minutes early due to time. Not sure if 1 and 2 will work. 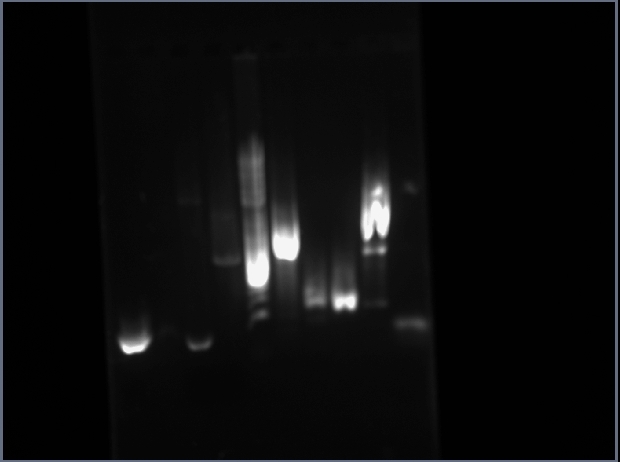 The XbaI enzyme solution is almost empty and less than .5 uL was added. Run gel on lanes 1,2,3,4. 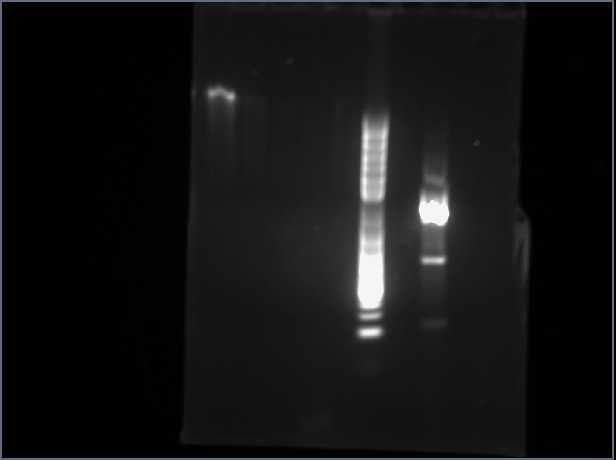 All samples result in bands in the expected locations. Submitting 1214 2 and 1214 4 for sequencing. This page was last edited on 12 April 2012, at 18:39.